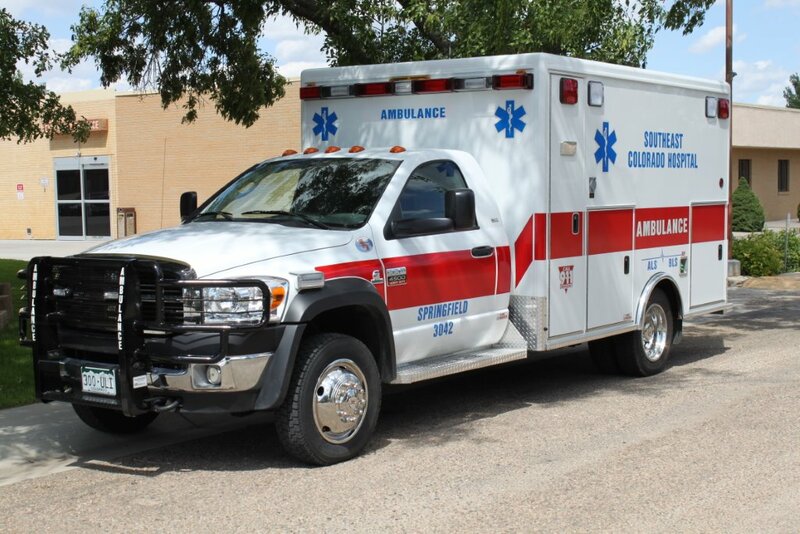 Southeast Colorado Hospital (SECH) Ambulance Service is owned and operated by the SECH District which encompasses the western two-thirds of Baca County and is under the authority of the governing body of Southeast Colorado Hospital. Based in Springfield, SECH Ambulance Service provides basic and advanced life support coverage to a population of about 2,800 living in an area of approximately 1,900 square miles. This includes the towns of Springfield, Pritchett, and Campo as well as Two Buttes Reservoir. 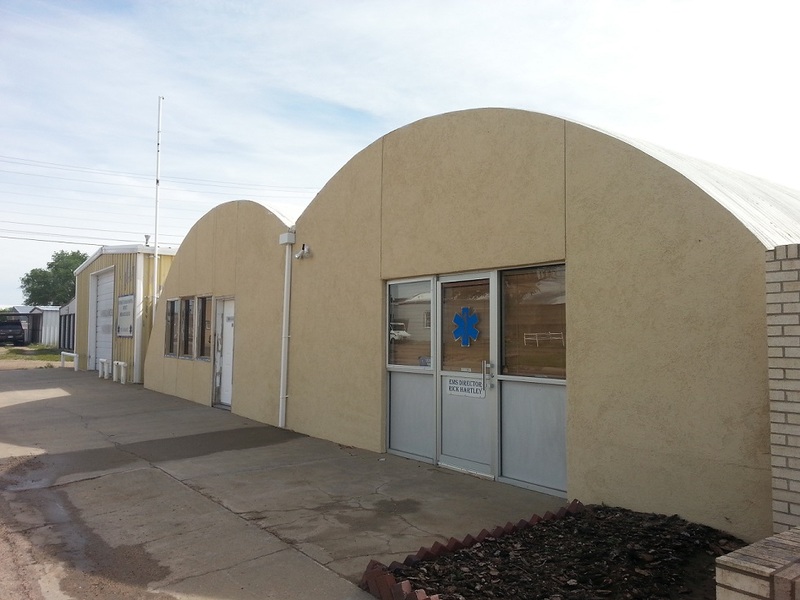 SECH Ambulance Service also periodically helps to provide coverage to the edges of several neighboring counties – Prowers, Las Animas and Bent. At times, the coverage zone has expanded south to assist Oklahoma and southwest to New Mexico as well. In addition, SECH Ambulance Service provides transfer services from SECH to higher level hospitals out of the area and from these hospitals back to SECH. In 2014, SECH Ambulance Service responded to 487 calls many of which involved multiple patients. Of those calls, 204 were 9-1-1 related medical or trauma incidents, 111 were interfacility hospital transfers, 85 were flight shuttles, 55 were standbys, 31 were cancelled calls, and one was an Advanced Life Support intercept with another agency. This is a significant change over the last 25 years as the call volume in the early 1990s was only about 70 to 100 calls per year – a nearly 600% increase in activity. In the last year our service logged over 45,000 miles. This 24 hour per day/seven day per week coverage is provided by one full-time paid Paramedic, two full-time paid Emergency Medical Technician (EMT)-Intermediate/99s, one full-time Emergency Medical Technician, two volunteer EMT-Basics and a small handful of volunteer First Responders and drivers. SECH Ambulance Service has come a long way since its inception. No one understands the work and sacrifice that has been required to make our service what it is today better than Rick Hartley, current EMS Director. Hartley took the EMT-Basic course in Springfield in 1984 and volunteered with SECH Ambulance Service until he took over as EMS Director in 1992. His tireless efforts in grant writing have resulted in nearly 1.5 million dollars of funding to dramatically improve our service. This includes acquiring better supplies, purchasing new ambulances, and providing training for the community, SECH Ambulance Service employees and volunteers, SECH District and the Walsh Hospital District Ambulance Service. Recognizing the need for an advanced level of pre-hospital care in our rural area, Hartley chose to increase his own level of training becoming an EMT-Intermediate/85 in 1995 then an EMT- Intermediate/99 in 1999 and finally Southeast Colorado Hospital’s first Paramedic in 2008. Injury prevention and training has been at the forefront of Hartley’s dedication to his community. He spends countless hours teaching EMT and CPR classes as well as a variety of other related courses. During his 23 year period as SECH EMS Director and 31 year career in EMS, he has been an instrumental leader in Baca County’s Emergency Medical Services. More than 25 EMT classes have been offered through SECH Ambulance Service and the Springfield EMS Association in the last 30 years and a fairly significant number of Baca County’s residents trained and practiced as EMTs at one point or another. Unfortunately, in recent years, the number of people taking these classes and completing the certification process has declined. Very few of those previously trained have retained their certification for various reasons, so the number of EMTs available to the community has significantly decreased. Volunteers are still needed. Even basic CPR and First Aid skills are extremely valuable regardless of whether you want to become a volunteer. SECH Ambulance Service and Springfield EMS Association offer a free CPR class to any in the community on the last Wednesday of each month. As a state approved training center, SECH Ambulance Service also periodically offers First Responder and EMT basic and advanced level training. Lovell made history along with Frank England and a few others when they became Springfield’s first EMTs in 1976. Worth Poteet who was also employed by the hospital and took that first EMT class, assumed leadership of the ambulance service in Springfield. By 1977, Poteet and Lovell were the only EMTs still responding with SECH Ambulance Service, and the need to recruit more help became quickly evident as they were “on call” for emergencies 24 hours a day, seven days a week. A second class was offered in 1978, taught by Dr. Antonio Manalo in Springfield. Among the 24 who took the class was Baca County resident, Dennis Ring. After responding to vehicle accidents, as a member of Otero County Sheriff’s Posse, Ring chose to become an EMT because of a desire to have the knowledge and training to “not just stand there” while waiting for the ambulance to arrive. He notes the significant changes in EMS during his time ranging from improvements in supplies such as c-collars, gurneys, monitors, and defibrillators to the dramatic changes in ambulances and the number of pre-hospital medications that can now be given. Ring proudly recalls the efforts of their team of EMTs and the community to raise money for the first new ambulance, a 1979 Ford Type III, a box type unit purchased in 1979. It was a monumental effort as they had to raise $30,000, a feat that seemed impossible to some at the time. Ring volunteered with SECH Ambulance until 2006 when he became a full-time staff member and just retired last year, retaining his certification for a period of 36 years. Change occurred rapidly in the early years, and leadership of SECH Ambulance was not an exception. After Poteet turned it over, the role was shuffled among a few other hospital employees including RN Dottie Woodhouse and in 1991, Tom Lovell, then head of the Lab Department at SECH. It became evident that a significant amount of time needed to be devoted to the ambulance service in order to maintain a high standard of care. Having a full-time job elsewhere in the hospital made this difficult, so in 1992, the job was offered and accepted as a full-time position to Rick Hartley, former hospital board member and volunteer EMT. Our service has seen a number of changes among our fleet of ambulances over the years as well. 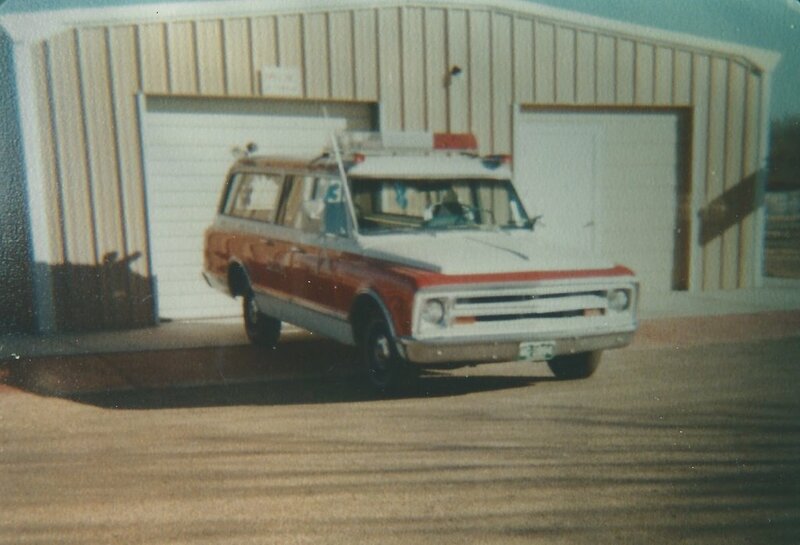 Hartley recalls how after trading in the 1979 Ford ambulance for a new 1987 Chevy Type I (box type), one day it caught fire due to an electrical short and burned. With the insurance money, they were able to replace it with a 1991 Ford Collins Type III Diesel (a box type), but while waiting on that ambulance to arrive they purchased a used Ford Type II (van type). In 1992, Hartley, applied for a grant to buy a new ambulance with 4×4 capability for emergencies occuring in harder to reach locations or on poor road conditions. 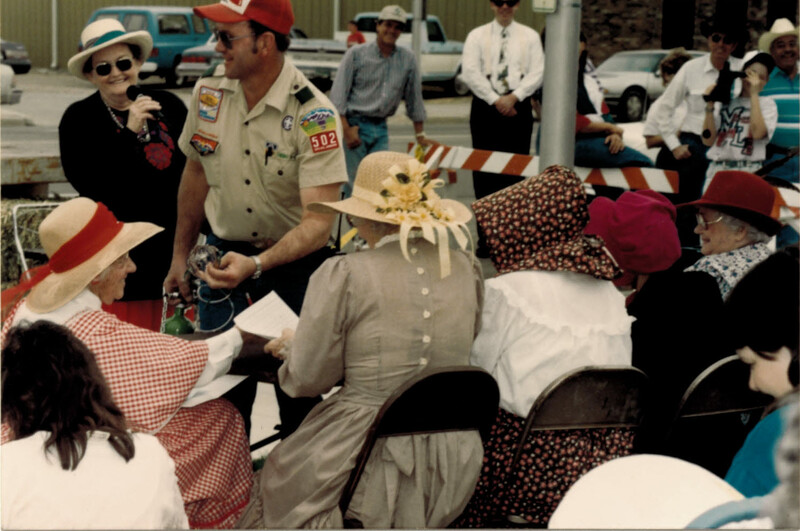 The grant, received from the State of Colorado, was used to purchase a 1992 Ford Type III ambulance as well as a blood pressure monitor and two automatic defibrillators. One stipulation of the grant was that the older used ambulance be placed in service elsewhere in the district. At the time, the Pritchett/Kim Quick Response Team (QRT) based out of Pritchett was in need of a unit, so the Ford van type ambulance was placed there. Later grants allowed SECH Ambulance Service to again update the fleet first with a 1997 Ford Type I, then a 2003 Ford Type I and most recently a 2010 Dodge Type I. 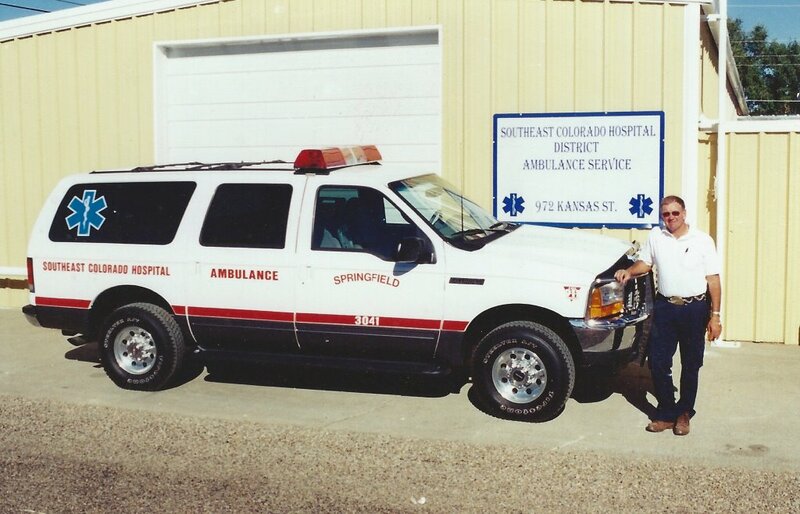 In addition, in 2001, SECH Ambulance Service became one of the first agencies in the state of Colorado to purchase a smaller transfer ambulance, in this case, a converted 2001 Ford Excursion. Later a 2006 GMC Yukon was added to the transfer fleet. SECH Ambulance Service now maintains two box type ambulances and the two smaller transfer units. All four units are stocked with the required equipment and supplies to operate an Advanced Life Support service. As replacements have occurred, the older model units have been donated or sold to other ambulance services or local QRTs. QRTs have played an important role in Baca County’s Emergency Medical Services. They were born out of a need for a faster response to emergencies in the most rural locations. They generally do not transport patients but instead provide supportive care until the nearest ambulance arrives. Kim QRT out of Las Animas County was the first QRT in the state of Colorado. It began providing service to the Kim area around 1979 or the early 1980s. 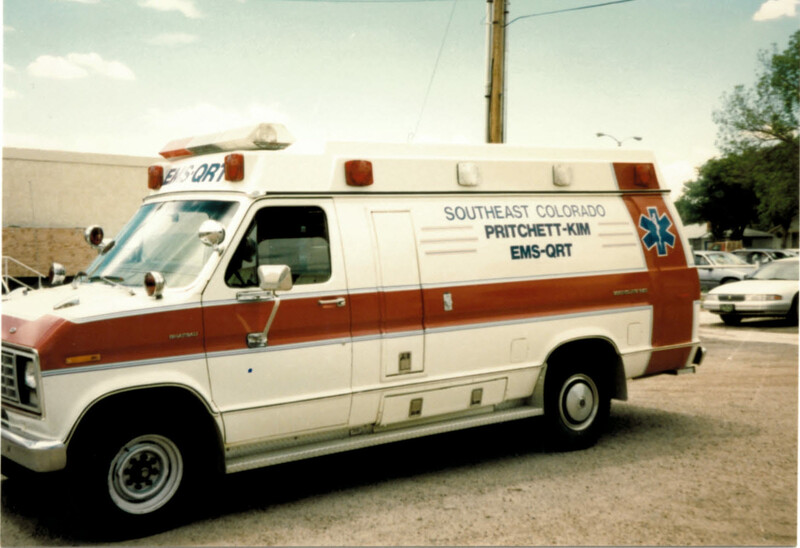 In 1991, a few people from the Pritchett area became certified EMTs so the two regions combined becoming the Pritchett/Kim QRT. Around 1995, Kim returned to operating their own service out of Kim and Pritchett QRT retained a unit until 2006. At that point, there were no longer any certified EMTs in Pritchett so the Pritchett QRT was discontinued. Kim Ambulance is still operative and currently under the direction of Lon Robertson, Paramedic. 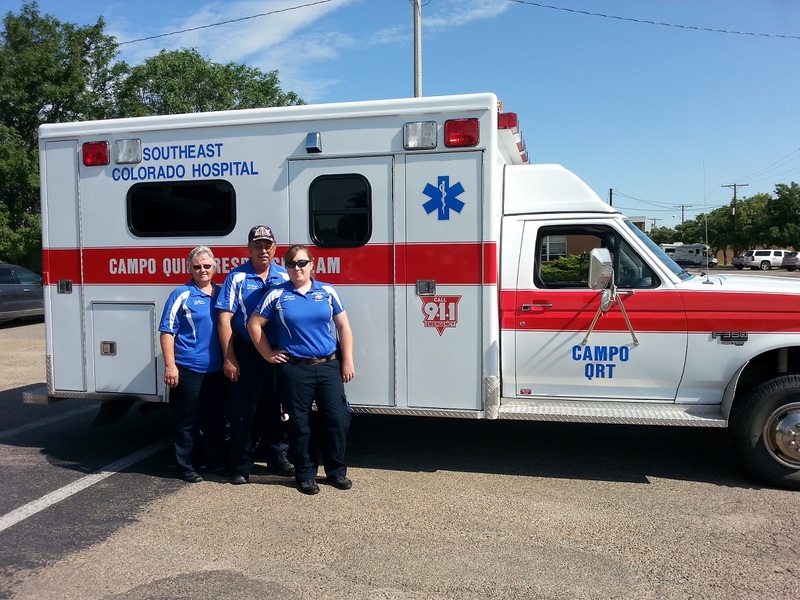 In the mid-1980s, at the encouragement of Worth Poteet, EMTs LeRoy and Esther England of Campo, along with several other early EMTs from that area started Campo QRT. Campo’s first QRT unit, a repurposed 1973 Chevy model van fondly recalled as “the brown bus,” responded to many a patient in need before it was later replaced by a box type unit. They currently operate with the 1997 Ford Type I vehicle donated by SECH Ambulance Service. Though they also assist Walsh Ambulance Service at times by responding to calls east of Campo, Campo QRT, is now a subsidiary of SECH Ambulance Service. Many have graciously volunteered their time in service through Campo QRT, but the Englands remain the only EMTs still practicing there. SECH Ambulance Service first housed ambulances in what is now the maintenance building north of the hospital. The building was initially shared with Central Supply, though Central Supply eventually moved. The ambulance service continued operating from that location until 1999 when Hartley applied for and received a grant to buy a different building and remodel it. 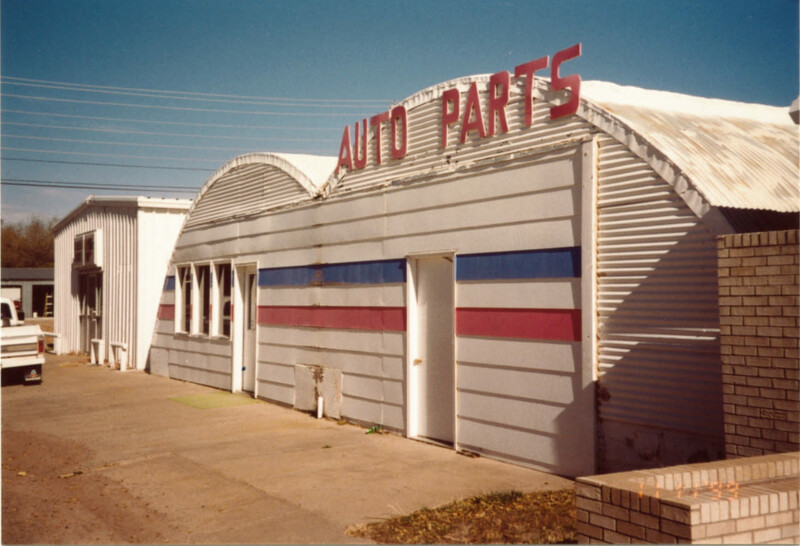 The old Auto Parts building on Kansas Street was purchased. Having significant construction experience, Hartley and his son, Jered, transformed the building into the current ambulance station with attached classroom and office space. In 1988, SECH Ambulance Service was struggling to find and keep volunteers to staff the ambulances. A shortage of equipment needed to treat patients was also a significant problem. SECH District, also experiencing financial limitations, was unable to provide the funds necessary to purchase additional equipment for the ambulance service. As a result, the EMTs decided to organize the Springfield EMS Association to provide support for the ambulance service. In 1990, Springfield EMS Association, Inc., became incorporated and filed for 501c3 non-profit status which was granted in 1992. The Association’s main goals are to provide man-power, funding for equipment, and training for current and new EMTs. They determined that any equipment acquired through their efforts would be donated to SECH Ambulance Service. The training they work to provide to all of the EMTs in Baca County is offered at no, or very little, cost to the EMTs. Funding is obtained primarily through grants, fundraisers, and donations. Furthermore, Springfield EMS Association Inc. offers CPR and First Aid classes as well as injury prevention training to the public at no cost. Collaborative teamwork between SECH District and Springfield EMS Association Inc. has brought SECH Ambulance Service up to one of the best small community ambulance services in the state. As we celebrate National EMS Week May 17-23, SECH Ambulance Service and Springfield EMS Association would like to thank you for your continued support and wish you a happy and healthy future.